Pharmaceutical companies have donated hundreds of thousands of dollars in the 2016 presidential election cycle. 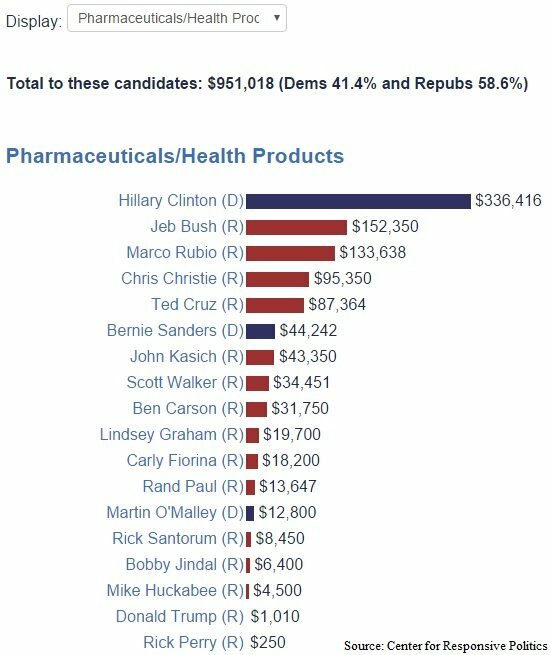 Guess which presidential candidate accepted far more campaign cash than any other from Big Pharma? The money went to…drum roll please...Hillary Clinton. What’s more, Clinton says she’s proud to have drug companies as her enemies. Those who think you can’t buy position in America are sorely mistaken. If there was truly any democracy left in this country, then I’d like for someone to show me. If we are supposed to be a system of government by the whole population or all the eligible members of a state, typically through elected representatives, how does Cargill, Ely Lilly, or Turing Pharmaceutical get to determine who runs the country? Clinton has been acting as though she has a tough stance on the industry, especially after news of Turing Pharmaceutical’s CEO Martin Shkreli increasing the price of an HIV drug called Daraprim by nearly 5,000%. But the money trail tells a different story. Clinton accepted $164,315 in the first six months of her campaign for President from drug companies, according to an analysis by Stat News. Clinton unveiled a plan to combat rising drug prices by clamping down on the rules for pharmaceuticals, and in a recent Democratic debate, she listed off drug companies among the enemies she is most proud to have made in politics. Really? These big, bad companies continue to be big spenders, donating $951,018 to presidential candidates in the 2016 presidential election, according to the Center for Responsive Politics and the Federal Election Commission – including to her campaign. Clinton collected $336,416 in donations from the pharma/health industry, over a third of the total contributions during the 2016 presidential campaign. The next biggest recipient was Republican candidate Jeb Bush, who collected less than half the amount of Clinton. Trump received a whopping $1001 – enough to buy one Daraprim pill. These donations don’t include the big money corporations spend on lobbying Congress as well. For example, Pfizer, one of the largest pharmaceutical companies, spent more than $10 million in lobbying efforts last year. The health industry overall — combining health professionals, hospitals, HMOs and pharmaceutical companies — donated over $9.5 million to the 2016 presidential candidates, making it the third largest donating industry. Clinton is still the top beneficiary from this group, receiving more than $3.5 million in donations. Clinton is also a big supporter for Big Biotech and GMOs – check it. She needs to be destroyed by any means possible. It’s making me sick how people are not seeing through her phony persona. I cannot believe that she won the nomination in South Carolina. What are people thinking? She is EVIL and is killing Americans, not with gunS, but with all the Poisons that she is advocating and promoting from Monsanto, BIG PHARMA and all the other Satanic Corporations that are financially supporting her. And to make an appearance in Flint, MI to look like she was upset and cared about the Poisoning Flint’s water – WHAT A LYING, FRAUDULANT, BACKSTABBING CREATURE! Wake up America! God Forbid we should let HILARY CLINTON HAPPEN!!! empathy,” Mrs. C insisted that America must “bring them to heel.” – Not amazingly, Mrs. C also gets donations from the privatized prison industry. If I go down your all going with me, though not exact wording, but none the less. Logical conclusion, our Govt is being held hostage. Kind o’ sounds a little weird to me, but it figures. She can’t seem to get over her snide arrogance. My opinion is that it’s likely to go down if she IS elected (anointed, appointed, whatever is substituted for actual voting). To me, it’s a clear choice: Bernie Sanders or Fascism. Getting elected, or voted for, is only one aspect of the process. The other is when said official gets into the position, 2 completely different beasts. Whoever assumes the Office in today’s environment is truly in for a surprise. This is the most important election in the history of the Nation and respectfully in my opinion I see no candidates qualified to engage the unknowns within the system that exists. But remember, I’m not politically inclined and not really into the voting thing, so I’ll reserve my opinions about politics and let the process take it’s course.